How do I add a strong “onion flavor” to the biryani (in restaurant style)? I've had chicken biryani in restaurants and their biryanis taste extremely different from what we prepare at home. I'm not sure how to describe it except that it's an "onion flavor". We've got loads of biryani recipes and they're all more or less the same. They're somehow adding an onion flavor. Either that or they're adding something else that has a strong pungent, sour flavor. They're adding an ingredient that gives a slight sweet taste. It's not tomato sauce, tomato puree, or sugar. There's something else. I've tried all of these methods. Perhaps it's milk in some way. 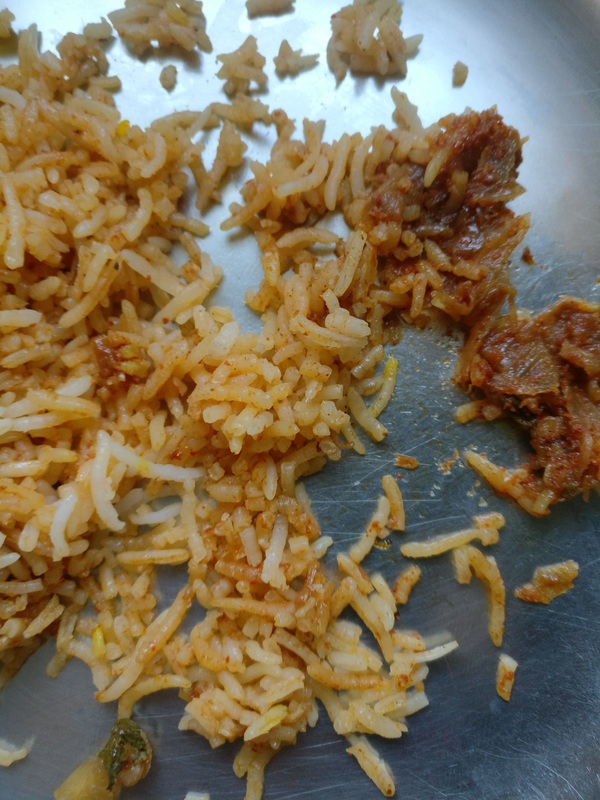 How can I give a strong "onion flavor" or something similar to it to my biryani? How are the restaurants doing it? Pic of an "onion glob". This is the strangest thing in the recipe. There are globs of onions between the rice. These are basically lumps of onions that stick together. They resemble a pigeon's egg (size and shape-wise). I've crushed open an onion glob to show what it looks like. Note: There are NO onions in the rice. Only the onion globs + chicken pieces (which contain very small pieces of onions). Inferences: They are clearly not deep frying the onions. I believe deep frying them leads to crispyness. These onions aren't crisp. 2) Pic of the chicken pieces: Another surprising thing about the taste is that the chicken pieces taste almost the same as the onion globs, except they're sweeter. Inferences: I'm guessing that they've mixed tomato sauce with the chicken but can't say for sure. 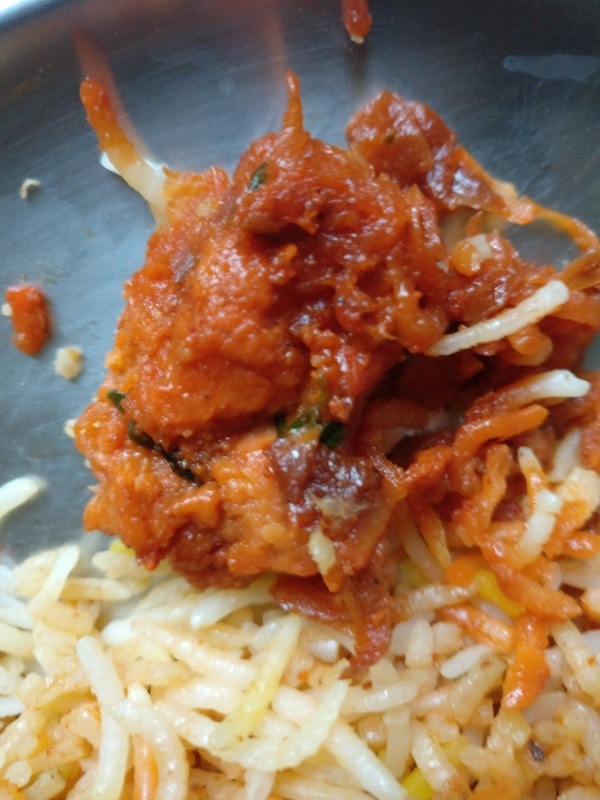 3) Pic of the rice: The rice seems to have very little oil. It sticks to my fingers. I can see that half of it looks like plain rice. All of it has a very very strong onion-like smell. Inferences: I suspect that the rice was cooked separately entirely. Then it was mixed with the onion globs, and steamed a little bit to catch that aroma. The restaurants may be adding asafoetida, a ground root product that adds a savory, onion-y flavor to food. It's very concentrated stuff and smells awful, but once you cook it for awhile it's absolute magic. I make biryani frequently. The recipe I follow differs from your link in a couple of areas. Specifically, in terms of your concern about onion flavor, my recipe uses much more oil, and twice as much onion. I slowly fry two, very thinly sliced, large onions (the variety doesn't seem to matter so much), in 3/4 cup of oil. The onions are cooked until they take on a golden hue. This can take 10 to 15 minutes. The onions are then removed from the pot. I leave about 1/4 cup of oil in the pot, which is the vessel that I will use to layer the rice, chicken, onions and herbs. This is significant for a couple of reasons. First, oil transports flavor. So, in addition to the onions themselves, there is a base of onion flavored oil. In addition, once the layers are complete, another 1/4 cup of the leftover onion flavored oil (from draining onions) is drizzled over the top. 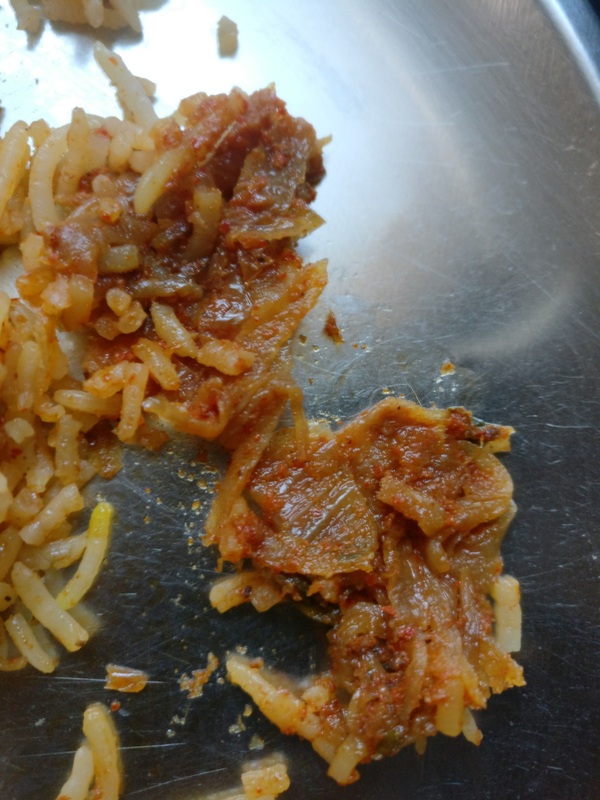 Secondly, the slowly cooked onions are layered throughout the biryani. (This also helps to create an excellent browned crust of rice and chicken when the final product is turned out of the pot). In my version, the spices are mixed with the chicken and yogurt, as part of a marinade. They are not added to the onion. However, I am sure there is much variation in how biryani is made. I am not suggesting a correct version, just some possible insight in how to enhance your onion flavor and sweetness (which comes from the caramelized onion). I would also add, that if you are indeed following the recipe to the letter, and using a pressure cooker, that pressure cooking tends to drastically mute onion flavor. I found this to be true when making stocks using my pressure cooker. I would try cooking this in the traditional way (not the pressure cooker) to see if that helps. I'm not sure if this gets at exactly what I'd call an "onion" flavour, but otherwise your experience sounds very similar to mine. I was pretty good at many different Indian recipes, but for the longest time, biryani eluded me. I tried all kinds of different things and ingredients and combinations, but could never seem to quite nail down a recipe that made my biryani taste "biryani-ey." Until finally I hit on the magic ingredient: methi (fenugreek)! I notice you don't have any methi in that recipe, so maybe give it a try and you'll discover that's what's missing? Can't hurt! The biryani recipe which I use calls for kewra (screw pine extract). This may be the slightly sweet taste which you are missing. Sautee some ginger garlic paste and add it to the chicken. The taste changes a lot between raw and sauteed ginger garlic paste. People react either very well or very badly to the smell when sauteeing this, it's okay even if the smell feels off. This will change both perceived sweetness and pungency. Raw paste is used relatively rarely in my experience. If you use asafodetia as suggested in another answer, use very little of it. Just a pinch in a biryani for 2 or 3 people. It adds additional flavor, but is probably not what you're looking for. It is not a common ingredient. The slower you cook the biryani, the better. Use coconut milk. It adds creamy and sweet flavor. If you can't find coconut milk, but can find a coconut, break it open, grind the white part into a paste using a mixer and squeeze it. You may also sprinkle the remaining cake separately before adding rice. A small potato, cooked and mashed before mixing in the lower layer can shift the flavour subtly to the sweet side. Some consider it a crime to mix potato in chicken biryani. You could try grating the onion rather than finely dicing it. Grating ruptures more of the cells and contributes a much stronger flavour throughout the dish. They may be adding tamarind paste. It's a somewhat sweet/tangy flavor and is common in indian cuisine. One of the “hidden” ingredients to boost onion flavor is shallots. Many restaurants actually use it in different ratios and that’s why the onion taste so great in those restaurants. I finally found the missing ingredient! It was commercial onion powder! Jonathan Moore's + pyro's answers came close to the real answers but both of them don't bring out the onion flavor any more than ordinary onions do. However, I came across commercially available "onion powder" (they basically mix some chemicals with the onions before drying them and grinding it, not into a paste but into a powder form). Onion powder tastes way more "onioney" than the actual onions itself. There's a pretty strong flavor of onions. I tried cooking biryani by adding onion powder to onions (just after adding the marinated chicken). It not only adds the strong onion aroma but gives a pretty good pungent, onioney taste. Off topic: I also found a bonus trick. Tomato puree! When this is mixed with the onion powder just before adding the chickens, it makes for a pretty strong pugent, sweet biryani flavor. If you search for 'indian base sauce' you might get some good hints. I've heard that usually in Indian restaurants, the curries are based on a 'base' sauce which is prepared separately. It has lots of onions, as well as some other veg and spices, and after the frying, the sauce is pureed. It might be that the process of pureeing releases more of the onioniness that you are looking for. Not the answer you're looking for? Browse other questions tagged indian-cuisine or ask your own question. How can I quickly save an unflavorful curry? How do I make dosas smooth and shiny? Getting rid of raw onion taste without the frying process? Could someone please clarify whether the following things make sense while cooking chicken biryani?